Its June 1st...that means it is time to link up with Farley for Currently! The first one is pretty self explanatory...its raining outside so my children are in the house going crazy ;) A bouncy ball gets pretty annoying very quickly! Luckily she is moving on to something else now. I say this very cautiously because many of you are still in school, but it is SUMMER!! We just completed our first week of summer vacation. I accomplished nothing (which feels wonderful). I did however go to Indy this weekend to take my 75 year old Aunt to a Wine and Canvas event. I love my aunt dearly and though she would have fun. After her initial panic attack, she calmed down and had a blast! Here we all are with our completed paintings...nothing like the original, but we had fun. I am a fish in the summer...we swim A LOT! Well so far this summer it has rained or been cloudy every day. I realized that I needed to start walking on a daily basis or use the elliptical that is in my bedroom. As I was talking to my 75 year old Aunt about her 7 mile walk she took that morning...I REALLY realized that I have to get moving. 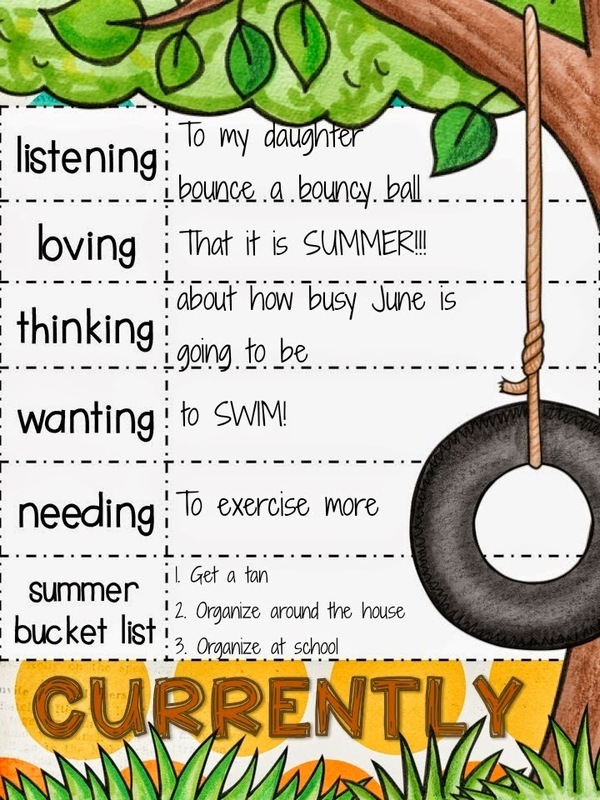 My bucket list is basic...get a tan, organize my house, and organize at school. I vow NOT to organize at school until after my beach vacation at the end of this month. I am so jealous that you have started summer break already. I still have about 14 more days with the kiddos, 18 without :(. I also need to get moving a bit more this summer, after my initial one week hibernation. I am like you. I wanted to organize my house and also get everything ready for the fall.